Home » Blog » Remainder Concepts for CAT – How to Find Out Remainder of a Number with Power? Figuring out the last digit is the same as figuring out the remainder of a number when divided by 10, but I guess you already know that. Figuring out the last two digits is the same as figuring out the remainder of a number when divided by 100. However, if you wish to figure the remainder when the divisor is not 10 or 100, I suggest you read on. 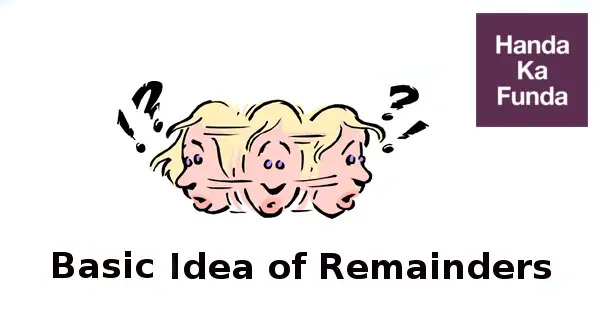 Basic idea of remainders can be used to solve complicated problems. There is nothing special or unique about this idea. At first glance it seems like something really obvious. But it is its usage that makes it special and helpful in questions related to remainders. Example 1: Find out the remainder when 2525 is divided by 7. Example 2: Find out the remainder when is divided by 7. We know that 43 gives a remainder of 1, when divided by 7. If we have 43k+2, it will give a remainder of 2 when divided by 7. Note: As you can see in solving this example, we have used the concept of negative remainder. In some cases, using the negative remainder can reduce your calculations significantly. It is recommended that you practice some questions using negative remainders instead of positive ones. Example: Find out the remainder when 415 is divided by 28. Note: If you wish to read more about it and how it happens, I suggest you read about the Chinese Remainder Theorem. Example: Find out the remainder when 715 is divided by 15. By using the above fundas, solving remainder problems will get a little easier. But if you are thinking, that this is all you need to know to solve remainder problems in CAT – I beg to differ. Great mathematicians like Euler, Fermat & Wilson developed some theorems that come in handy while solving remainder questions.